Where people shop has changed dramatically; have your retail strategies kept up? Three decades ago, if you needed groceries, you went to your neighborhood grocery store. Now, you’re just as likely to grab tonight’s dinner, or at least some staples, while you’re picking up some plywood or a prescription. As recently as 1988, the traditional grocery store, the supermarket, commanded 90 percent of grocery products sales. But competing formats had been planted a decade earlier: the first Aldi in 1976 and Whole Foods in 1978 (and Trader Joe’s traces its roots back to 1966). Then came the club stores (the first Costco and Sam’s Club opened in 1983). While the first dollar store, Family Dollar, opened in 1959, the format exploded in the 1990s and became a major retailer of food. Now the “traditional” grocery store (Willard Bishop consulting defines that as supermarkets, fresh format stores, limited assortment stores, super warehouses and other/small groceries) commands half its previous share (see Figure 2). Non-traditional grocery (wholesale clubs, supercenters & mass merchandisers, dollar stores, drug stores and military bases) account for 39 percent, and other formats – primarily convenience stores and eCommerce – claim the remainder. Then there’s the Internet and smartphones. Menard’s, a Midwest chain of huge home improvement stores, devotes several aisles to nonperishable foods. Even Uber has begun delivering groceries in some cities. Add it all up and you have one of the newest buzzwords: omnichannel. Omnichannel means different things to different companies, but it generally requires a multichannel approach to sales that seeks to provide the customer with a seamless shopping experience, whether she is shopping online (from a computer or a mobile device) by telephone or in a bricks-and-mortar store – and sometimes all of the above. If you think consolidation has wreaked havoc on the food and beverage processing business, pity your poor customer – if he’s still around. While the top four players accounted for 17 percent of total grocery sales in 1992, they accounted for more than 35 percent of sales in 2013. That top four being (in order) Walmart, Kroger, Safeway and Publix Super Markets, according to Market Realist and Progressive Grocer. Just 20 years ago, it was unthinkable that the leading seller of groceries in this country would be Walmart (it became the No. 1 grocer in 2001 when its grocery sales reached $56 billion). Perhaps just as unthinkable was its 2014 huge commitment to organic foods. Lest competitors think the big store has the Midas touch, even Walmart is hitting a rough patch. The company said it will close 269 stores in 2016, about half of them in the U.S. and two-thirds of those being the smaller Walmart Express, which have more of an emphasis on food than the big-box stores. Everybody wants to sell food! Despite talk of its demise, the supermarket appears to be holding its own. In Willard Bishop’s “The Future of Food Retailing Report,” based on 2014 figures, the supermarket eked out a 0.3 percent increase in dollar share to stay above 46 percent (Figure 1, top). “The traditional grocery channel continues to maintain its leadership position, and is likely to do so for decades,” the report concludes. At the Food Marketing Institute’s January Midwinter Conference, a panel pronounced the grocery store “alive and well,” in the words of Thom Blischok, PricewaterhouseCoopers’ chief retail strategist. “Click will not surpass brick” was the theme. While much of the discussion turned to the Internet, the panel agreed online sales will not overtake in-store sales in the grocery industry. But retailers will have to figure out how to deal with, how to deliver, “the omnichannel experience,” at least for some shoppers. The panel did believe it’s a sure bet there will be fewer traditional grocery stores in the future, and many will be doing as much Internet order fulfillment – “click-and-collect” – as browsing-the-aisles selling. 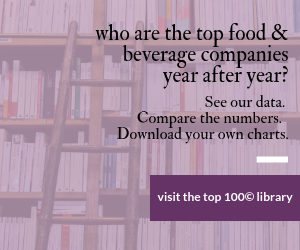 How are you food and beverage companies dealing with these newcomers, and what kind of changes are they forcing on you? (Think: cleaner labels, less processing and different package sizes). In simpler times of fewer SKUs, there was plenty of room at the grocery for several brands in each category. Now there just isn’t enough room, as new and niche products in other aisles and categories crowd out the number of brands of traditional staples stores carry. In the ketchup aisle, Heinz will be there and maybe Hunt’s too, but try finding Del Monte. The remaining space allocated to the condiment will likely include the retailer’s brand and perhaps an organic brand or something exotic (sriracha ketchup? ), maybe a local favorite. “The consolidation of the retailers is giving the survivors more leverage,” says Lance Layman, vice president of business development at SugarCreek, a Fairfield, Ohio-based processor of bacon and more recently of sous vide products. “Smaller stores are going to carry fewer SKUs. That probably means they’ll carry the national brand leader and one other, either a niche product or their store brand. Perhaps no category is as dominated as the salty snacks aisle. Yet, despite several yards of Frito-Lay products, it seems every city has a regional favorite that manages to steal some space from the leader. But keeping that facing is a constant battle, says the marketing vice president at one regional snack manufacturer. “We’ve had to adapt, to learn to not just go to the supermarket but to mass merchandisers, club stores, drug stores, et cetera,” he says. And to answer retailer demands for variety packs, cleaner labels and “healthier” products. Bob Mariano rose through the ranks of former Chicago grocery chain Dominick's, and as president he prodded the owners to update the stores into a modern, fresh market. But the money was never there, and he left when Safeway bought the chain in 1998. Fifteen years later, as president of Milwaukee-based grocer Roundy's, he bought 11 Dominick's stores as Safeway shut down the chain and exited Chicago. The stores reopened weeks later as Mariano's Fresh Markets. By the end of this year, there should be 39 Mariano's Fresh Markets, all in Chicagoland and most of the new ones greenfield sites. Mariano told a Chicago newspaper he aims to make his namesake stores the "Nordstrom of the grocery world." Generally speaking, he's after the middle and upper-middle class, shoppers he once described as making multiple shopping trips: to Whole Foods for organic products, perhaps a specialty store and the big retailer (Jewel) for the staples. Mariano's brings all three experiences under one roof, along with an Italian coffee shop serving authentic gelato, a wood-fired pizza oven and sit down sushi bar. In-store culinary centers offer cooking demonstrations and a wide array of prepared meals The CEO describes it as a neighborhood shopping environment; customers liken it to an Italian produce market. Intrigued more by the Mariano's Fresh Market approach than the traditional approach of Roundy's, Kroger announced last November it was buying Roundy's for $800 million. "We admire what Bob Mariano has done with the Mariano's banner in Chicago, where he has created an urban format that is resonating with customers," said Rodney McMullen, Kroger's chairman and CEO. "We expect to apply Roundy's experience to our stores in urban areas around the country." Bob Mariano is staying on. He also notes a shift away from direct store delivery. “It used to be 90 percent of our business; now 65 percent of deliveries are going through the stores’ warehouses and distribution centers,” he says. In the 1980s, warehouse and club stores forced processors to think big: bigger package sizes or multipacks to fit that emerging store format. Now processors are being asked to think small, as many dollar stores require packages than can be retailed for $1. Some of the scariest new ground for food processors and their retail partners is eCommerce. The Internet decimated traditional ways of selling travel, books and music; will it similarly rewrite food retailing? "Could Amazon do to groceries what it did to books?" was one headline we found online. There's no doubt eCommerce is rapidly growing, albeit from a tiny base. "Some CPG manufacturers say that more than 40 percent of their growth has come through digital commerce," Willard Bishop reports. "While supermarket sales for many manufacturers have been flat, those with an active eCommerce strategy are the beneficiaries of this new-found growth." Yet it currently accounts for just 2 percent of total CPG sales. Willard Bishop, which likens it to the "wild, wild west," expects eCommerce to account for 10 percent of volume in 10 years or less. In addition to opening new stores with less selling space, winning retailers are likely to retrofit existing stores into multi-functional store-hubs or storehouses, predicts Jim Hertel, managing partner of Willard Bishop. These multi-purpose locations will provide a localized assortment of products in the selling area, while reserving backroom square footage for safety stock, staging home deliveries, and for the fulfillment of click-and-collect orders. Selling your products is just the tip of the iceberg. Taking it to the Nth degree, eCommerce can also bring you customer engagement, data collection, insights. Imagine the joy of auto-replenishment. Imagine what you can do with the email address of a customer. "Make no mistake, eCommerce is impacting every area of consumer goods retailing including shopper behaviors, purchase cycles, new item introductions, assortment, merchandising, pricing, trade spending, store layouts, unsaleables, and many others," the market research firm writes. "Consequently, those with a data-driven eCommerce strategy in place will be positioned to capture market share at the expense of the laggards. "And market share is just the tip of the iceberg. Armed with the right mindsets and datasets, astute manufacturers will build brand loyalty through digital engagement. This electronic connectivity will facilitate R&D, and be particularly beneficial for new item introductions, promotion planning, and increasing brand loyalty. "Conquering eCommerce does not mean having all the answers," Willard Bishop concludes. "Conquering, at this stage, means the organization has developed an eCommerce strategy, knowing that the plan must be malleable. It must change as new insights are revealed and as the organization’s capabilities expand." With this much churn going one, only a few things are certain. Over the next five years, shoppers will further spread their purchases across multiple channels. And retailers – regardless of the channel they most identify with – will expand their focus on natural and organic products. Market View: Are You Ready for the Changing Retail Landscape? Each searches for relevancy with consumers. How relevant are you? Government data chronicles shifts to foodservice, alternate formats.